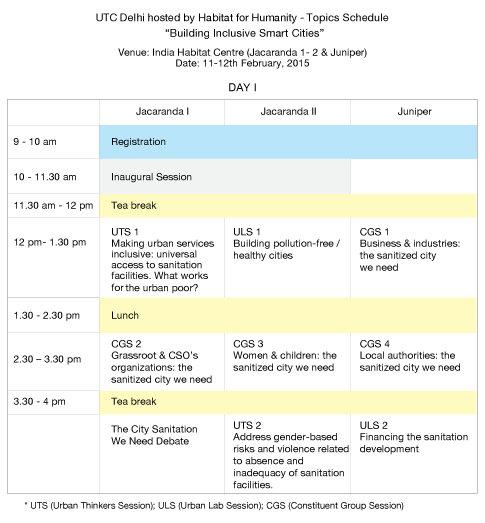 The Urban Thinkers Campus is a two day event, hosting top experts in the form of panel discussions across a spectrum of topics in the area of SAFETY and SANITATION from the urban inclusion point of view. The discussions will be held in three panel formats: the Urban Thinkers Sessions, the Urban Lab Sessions and the Constitutent Group Sessions. 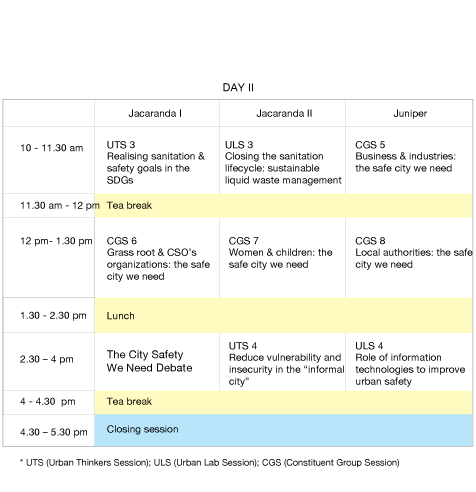 The Urban Thinker Sessions (UTS) are meetings where academia, think tanks, research organisations, planners, futurologists will come together to offer perspectives for better safety and sanitation conditions in cities of the future. The Urban Lab Sessions (ULS) will host practitioners who will present their ideas and debate on practical past, present and future models and solutions. Constituent Group Sessions (CGS) will gather representatives of groups that constitute one important stakeholder section on both themes of safety and sanitation. The four constituent groups are: (1) business and industries, (2) local authorities, (3) grassroots and civil society organizations, and (4) vulnerable groups. By discussing the nine principles of “The City We Need”, each constituent group will be able to take a common stance on the most fundamental urban issues. Henceforth, CGS play a pivotal role in ensuring all voices of urban society being heard to define the Habitat III New Urban Agenda. Ideas, suggestions and feedback from these sessions will be documented and presented to the World Urban Campaign Secretariat as a joint statement with recommendations on "The City We Need". All UTC outcomes will feed into The City We Need 2.0, which ultimately will feed into the Habitat III New Urban Agenda.